In my family we all love Italian food , be it pasta, salad or garlic toast. 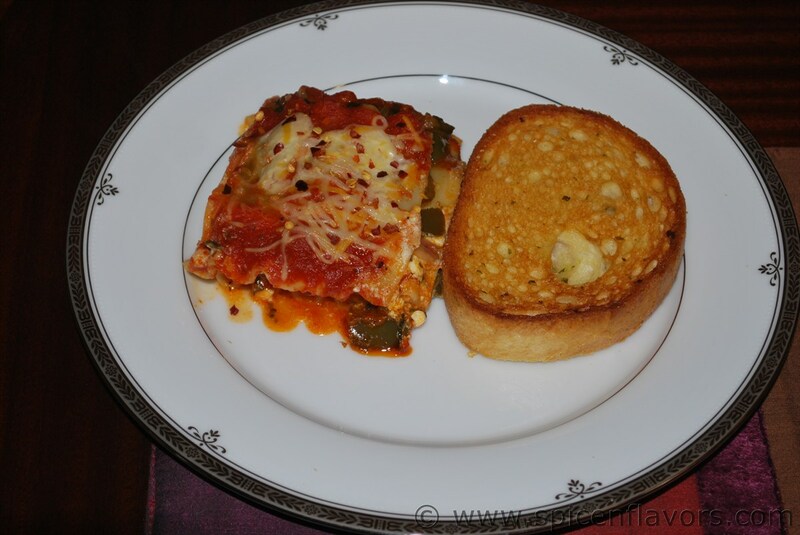 But our absolute favorite is Lasagna, made with a twist ~Vegetable Lasagna,, we love to make it at parties and get together s and enjoy it with our friends. Using a large pot, heat 4 cups of water and bring to a boil. Add salt to taste. Cook lasagna noodles in boiling water for 8 to 10 minutes. Drain noodles, and rinse with cold water. In a mixing bowl, combine ricotta cheese and cottage cheese. Add ½ tsp salt. Chop onions & capsicum into small pieces. In a frying pan, add 3-4 tsp olive oil and heat it. Add chopped onions, capsicum & spinach. Sauté it for 8-10 minutes. Add few pieces of pineapple chunks. Add ½ tsp salt and mix it well. Add 3-4 tsp of hot sauce and sweet & sour sauce. Stir it for 5-7 minutes till it is well cooked. Remove it in a bowl. Place 1 sheet of lasagna noodle on the bottom of a rectangular dish, for layering, take a spoonful of ricotta and cream cheese mixture and spread on the lasagna first layer, pour some pasta sauce over it and cover with another lasagna noodle, alternate with the onions, spinach and capsicum mixture, cover it with a lasagna noodle. Pour some pasta sauce on top of it. Repeat layers. Cover last layer with remaining mixture. Once you have completed the layers, pour some past sauce on top. Sprinkle shredded cheese on the top layer and garnish with black olives. Preheat oven to 375 degrees. Place the lasagna dish in the oven. Let it bake for 20-25 minutes, and till the sprinkled cheese has melted and the top is golden brown.Allow to cool before serving in a plate. WOW! LOOKS DELICIOUS.I'll try soon. Very well presented, Yum twist, looks very appetizing!! I never thought we can make lasagna at home!! wow! looks yummy.. and The Mr. and The Daughter will love it... need to take out a printout NOW... thank you for sharing. I will surely try my hands at it. Thanks for sharing the recipe. Follow my blog at http://followfoodie.blogspot.com/. Ideally it should work.. i dono why iyts not.. In case your not able to link it.. send me a mail of your recipe name, url & id.. i shall link it :).. B/w yum lasagna.reminds me sweet chariot ! Viya.. You have to link the url oif the recipe.. As in.. click on the name of your recipe.. the url which comes there..copy that & attach to the Link Url..Title your dish name & ur id.. Don't attach your blog url.. Try this i think it should work! Wow...lasagna sounds very interesting n yummy...well made dear!